The holidays are the busiest time of the year, not only when it comes to shopping, but cooking too. Whether you’re serving 2 or 20 people, tapping into time saving tips for meal planning is the key to success and less stress. Here is some of our favorite meal planning tips to help your kitchen run smoothly. Make a list: Before you start meal prep make sure you have your menu planned, and list what is needed for each recipe. You don’t want to be missing Grandma’s secret ingredient for the family’s favorite recipe! Make two lists: a menu and a grocery list. We recommend writing a separate “Holiday Dinner” grocery list as well. Pro Tip: Don’t try to include the weekly necessities you would normally buy in this trip, it’ll be too overwhelming and confusing. 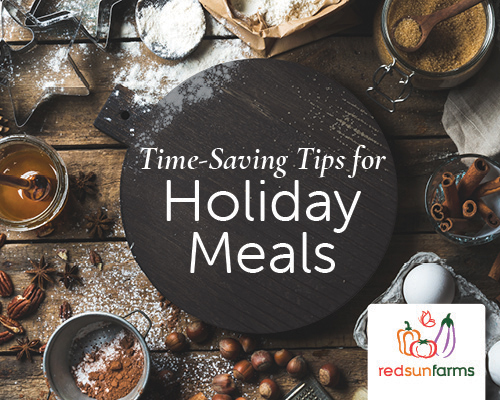 Cooking Plan: Holiday meals tend to have multiple recipes that need to be made throughout the day; and don’t forget about those last­- minute items that all need room in the oven at the same time! Review your menu ahead of time and make a timeline for when to prepare each recipe. For day-of recipes, try to batch them together so there’s a morning set of recipes, and a before-meal set of recipes. Take a break in between and enjoy some family time! Ingredient Prep: Look at the ingredients of each recipe and grate, chop, or prep whatever you can head of time to avoid unnecessary time spent in the kitchen. Most fruits and veggies will keep well in the refrigerator, or even in the freezer. Clean As You Go: We recommend designating an honorary dishwasher (or two!) for the day! After all the time spent prepping, cooking and eating the meal, the last thing you want to do is clean up after it! This is a great way to get everyone in the family involved and spend a little extra one-on-one time. Help is On the Way: In addition to your honorary dishwasher(s), delegate jobs to each member of the family: setting the table, answering the door as guests arrive, keeping the kids/dog out of the kitchen, anything that will help you save time. And remember, enjoy the day too!